I once had coffee in the home of a former Israeli soldier, watching as he held his infant son against the drapes, near the top. When the baby reached out and gripped the curtains, his father let go. The baby clung there, his eyes wide with panic. When I asked the man what he thought he was doing, he said, “He needs to learn to be tough.” He left the baby clinging to the curtains for another few seconds that felt more like an hour. That’s the kind of parenting I can imagine Eric Bana’s character giving his daughter in Hanna, a smart action-thriller from Joe Wright, the director of—wait, there must be some mistake!–Pride and Prejudice and Atonement. Maybe this is what you get when you have a director of complex, richly-layered films address a genre like this, a film where even the most minor characters seem real. Hanna is home-schooled with a vengeance, literally. She’s raised by a former spy to be a warrior with a very specific purpose. When the time is right, she proves that she’s ready, and each departs separately from their ice-bound cabin in the North, only to meet up when the mission is complete. Cate Blanchett is the mission, a woman who may or may not be Hanna’s mother and who has a relentless desire to see both the former spy and Hanna killed. The plot uncoils with the requisite revelation of secrets and surprises and plenty of chase scenes, killings, and hand-to-hand combat. 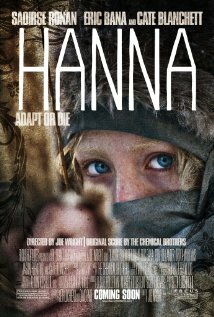 Saoirse Ronan, who plays Hanna, fights well-muscled thugs who are two feet taller. But somehow she makes the fights seem real, a testament to her acting chops and Joe Wright’s solid directing. But Hanna is about more than its well-choreographed action scenes. It calls to mind La Femme Nikita, another story of a young woman kept in isolation, where she’s trained to be a killer. Visually, it’s a highly stylized updating of the kinds of tales you read in The Brothers Grimm, to which the film often alludes. In the mother-daughter clash that is the film’s essence, it’s a retelling of Electra. Cate Blanchett plays the villain so coldly that you expect to see ice crystals in her eyebrows. The role’s a type. There isn’t much for her to sink her teeth into, but she has plenty of fun with it. Eric Bana brings his patented brand of intensity to bear on the role of the former spy who’s driven by a father’s love and a healthy appetite for vengeance. Among the other stand-out performances is Tom Hollander’s. He plays Isaacs, Blanchett’s cats-paw, who never met a person he didn’t want to kill. In what must be a deliberate homage to Fritz Lang’s M, he whistles when he’s at his most dangerous. Even the minor characters have a richness you almost never see in action-thrillers. In a desert interlude, Hanna joins a British family on holiday. And though the audience is given little or no exposition about them, each member of the family—husband, wife, and two children—feels as if he or she has walked straight out of life and into the movie. Olivia Williams is especially good as an aging hippie who is all for independence, not realizing how independent their temporary travel companion really is. Jessica Barden has a nice turn as the precocious daughter who befriends Hanna. Later, when the travelers think Hanna has moved on, she’s actually hiding in a storage compartment in their van, watching them through a hand-hold. The scene makes you think of Frankenstein’s monster hiding in the woodcutter’s cottage, watching through a chink in the wall in order to learn how real human beings behave. With pale blond pre-Raphaelite curls, Hanna has the soft blank face of someone who’s been kept away from the world, a hothouse flower. Despite all her training, Hanna is still a child, still human. As soon as she’s away from her father, she begins to experience, not feelings themselves, but the tremor of feelings, like half-heard music from another room—love, affection, friendship, and the desire for something more than vengeance. She invites a boy to kiss her, only to throw him to the ground when he tries. When she leaves him lying there stunned, she says, “It was fun.” Music undoes her, especially the vacationing family laughing and singing together. But true to the genre, neither she nor the filmmaker will allow those feelings to get in the way of some good old-fashioned punching, kicking, flipping, shooting, and strangling. Brief aside. Speaking of music, the score, by The Chemical Brothers, hits just the right blend of hard-driving, drum-driven techno for the action scenes, alternating with a warped music-box tinkle to underscore the twisted fairy-tale quality of the story. Most movies of this kind are filled with meaningless action (think Sucker Punch). This one is filled with meaningful action—action that’s a direct outgrowth of character, plot, and theme. A good action-thriller should be about something outside itself, not just the central action but the world outside that action. It’s one reason Hitchcock was so good. The Birds is not only about the attack of the birds but about the community that’s under attack. Hanna is about family ties—the ties that bind and the ties that cut off the circulation. What’s next for Hanna? I have a feeling her long-lost sister, Lisbeth Salander, may be looking for a roommate.